Music is the beating heart of Malian culture, but when Islamic jihadists took control of northern Mali in 2012, they enforced one of the harshest interpretations of sharia law in history: They banned all forms of music. Radio stations were destroyed, instruments burned and Malis musicians faced torture, even death. Overnight, Malians revered musicians were forced into hiding or exile where most remain, even now. But rather than lay down their instruments, the musicians are fighting back, standing up for their cultural heritage and identity. 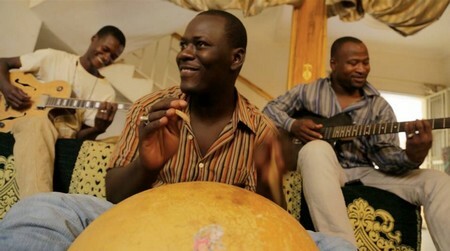 Throughout their struggle, they have used music as their weapon against ongoing violence that has left Mali ravaged. They Will Have to Kill Us First sees musicians on the run, tells the story of the uprising of Touareg separatists, reveals rare footage of the jihadists, captures life at refugee camps where money and hope are scarce, charts perilous journeys home to war-ravaged cities, and follows our characters as they set up and perform at the first public concert in Timbuktu since the ban. With a soundtrack created by the Yeah Yeah Yeahs's Nick Zinner and featuring the breakthrough Malian act, Songhoy Blues, we caught some time with them to discuss their discovery by Damon Albarn's Africa Express and political oppression. Can you tell me about your experiences with Africa Express? We’d never met as talented musicians as through Africa Express. They were the ones who discovered us and took us into the studio and taught us all of the technical aspects of recording. They pushed us to tour internationally as well. We were introduced to Africa Express by an uncle and he was one of the technicians who was working with Africa Express when they came to Bamako. Our idea was to make a demo tape in our uncle’s studio, but it just so happened that he was working with Africa Express. He said you should definitely do this demo, but you should also get in touch with these guys who were in town scouting for young talented musicians for Africa Express. We called up and went for an audition at a club in Bamako in front of a delegation. The next day, they invited us to a studio. It was the first time we’d ever been in a studio since we started the band. Damon Albarn’s musicians were there, Nick Zinner was there. That’s when we recorded ‘Soubour’, our debut single. We didn’t have any idea as to how to record until then. Damon Albarn formed Africa Express after visiting Mali in 2002 to record Mali Music. What is it that’s so special about Malian music specifically? What makes it really unique and special is that it is a melting pot of lots of different sounds. There are also different ethnicities in Mali and languages running from the north to the south. All these different cultures. All those difference are apparent in the music. Johanna Schwartz, the director, has put in rather graphic footage of a hand being chopped off. How do you feel about its inclusion in the film? It was a reality in the north, so it’s good to include it. The main objective was to display exactly what was happening in a realistic way in 2012. Everyone in Mali is already aware of what happened, whether it’s someone getting their hand chopped off or it’s someone getting beaten. These were all realities of what happened. There’s a part in the film where Oumar is talking about how’re dealing drugs and arms. That was the point where we thought we were treading a fine line. That’s the most delicate. Today, we are even better known in Mali and it could be compromising for us to say these kind of things. The people of who we said those things are still in Mali. We are not in the best position to talk about these things. Especially in Mali, security is not really the best, even for people high up like presidents and so forth. It’s dangerous. Once, the state security stopped Oumar because his brother-in-law was a rebel. He was a speaker. He was one of the main representatives of the MNLA (National Movement for the Libersation of Azawad - political group). At the beginning of the crisis, he was the one sending money back to his family through Uma and the Malian state security found out, took Oumar, put him in jail and questioned him for a day. That’s just one thing that the Malian state security have against him now. It’s on his record now. Everyone knows what the problems of Mali are, but one person can't stand up for themselves because the freedom of expression is limited. We are not allowed to speak freely. The rebels wanted to create a state that was not controlled by the current government involving arms trafficking, cocaine smuggling and we just can’t talk about it. Johanna (the director of the film): At one point, we all sat down together and watched the scene where Oumar said about the arm and drug traffickers and we worried if they would be safe if we put that in. And they said, put that in, it’s the reality. It was their decision to keep it in, because, obviously, we don’t want to put anyone’s lives in danger with a film like this. But they’re ridiculously brave. How palpable is fear in Mali since 2012? We are not scared of anything, because we know that what’s going on has nothing to do with us, but the film that we made with Johanna and the fact that it is going to be shown internationally. We are not politicians ourselves, but we certainly participated in a political way by speaking in the film, because we touched on political questions. They Will Have To Kill Us First is in cinemas from 23rd October 2015.